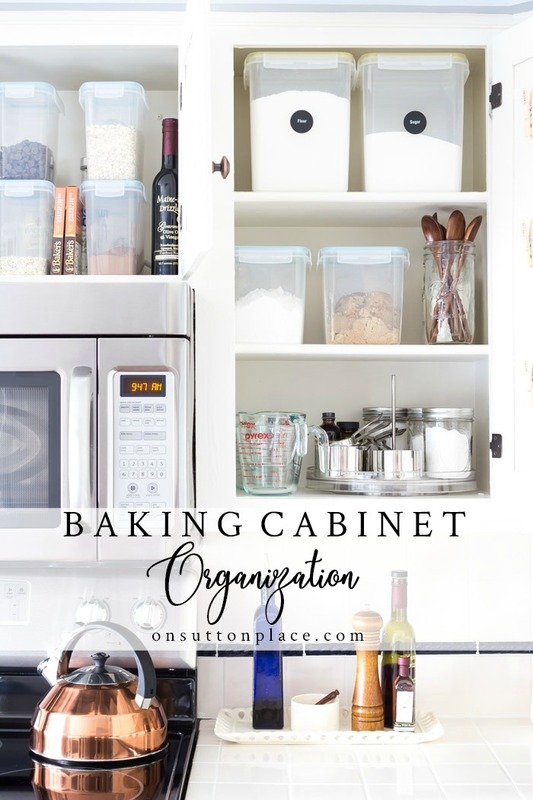 Tips for baking cabinet organization & spice storage ideas that anyone can use. 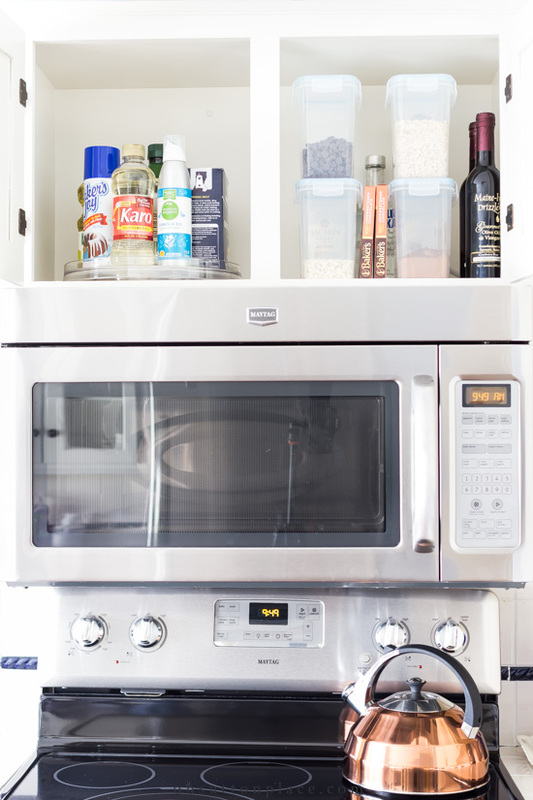 Transform your cabinets into functional and accessible spaces! My kitchen organization project continues! Up today is my baking cabinet, which turned out much better than I expected. The cabinet is very narrow and I didn’t have much hope that I could really make it work. 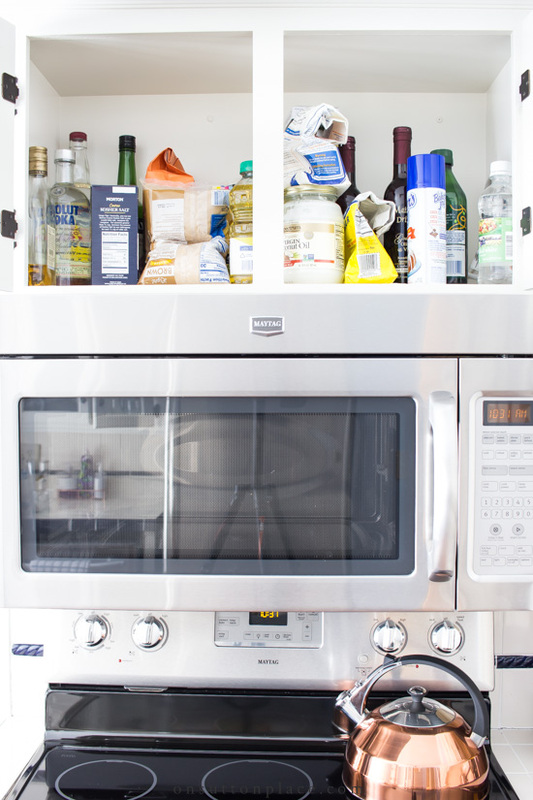 Because my baking cabinet is so small, I use the high cabinet over the microwave for overflow items. The cabinets are side-by-side, so it was the most logical choice. Basically everything! Because of my general frustration with our kitchen, I had let these cabinets go to ruin. To put it simply, they were a mess. There was no rhyme or reason to be found on any shelf in either cabinet…like the random bowl on the top shelf. I have no idea why it’s there! My main goal was to clear the spaces of things I wasn’t using to make room for what I need. I wanted uniform and air-tight containers. Because of space limitations, I needed to make the high spaces accessible. 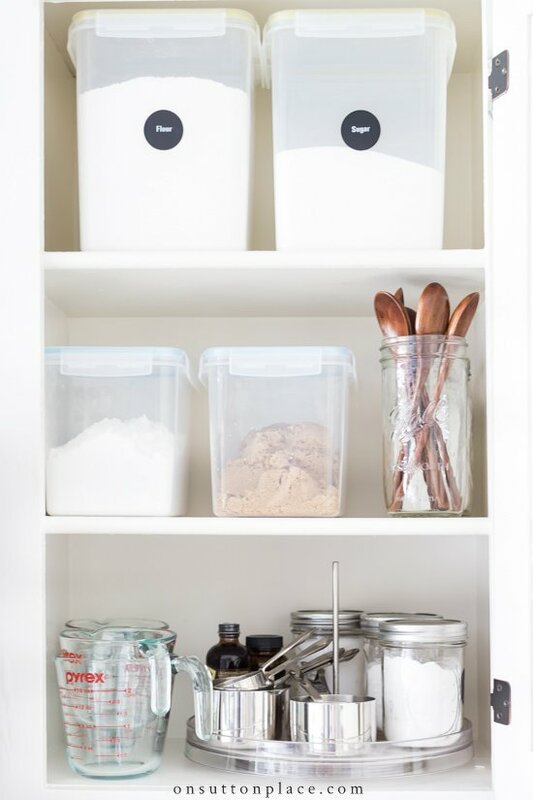 Previously, I stored my flour and sugar in glass canisters on my kitchen counter. They were constantly getting dirty and the lids were very heavy. They just weren’t working and I wanted to hide the flour and sugar in a cabinet. It took some time looking online, but I finally found large containers that fit on the top shelf of the baking cabinet. They sit right at the front of the shelf, so I can reach them with no problem. The middle shelf stores powdered sugar, brown sugar, scooping spoons, and corn starch. 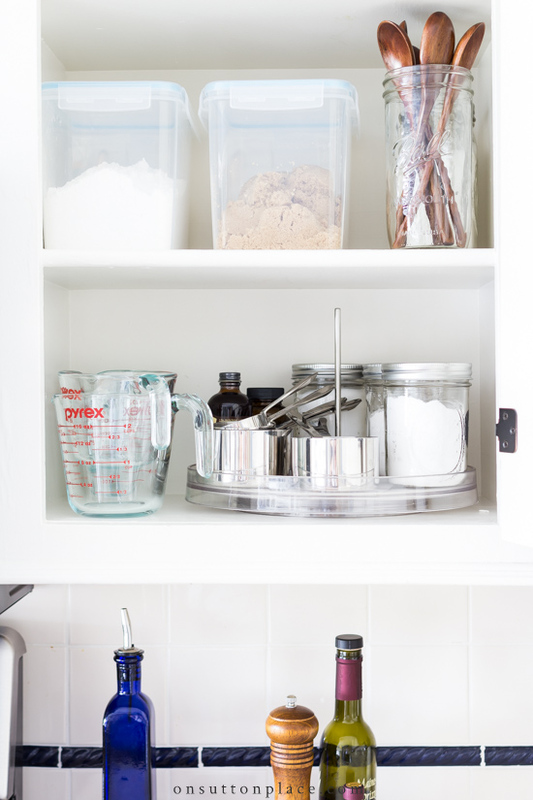 The bottom shelf, which is the most accessible, stores the measuring tools, vanillas, baking soda, baking powder, and salt. An 11 inch lazy Susan helps keep everything together. The cabinet over the microwave got an 11 inch lazy Susan to corral the bottles and cans. The air-tight containers hold chocolate chips, barley, oatmeal, and cocoa powder. Unfortunately, I do not have a “before” picture of my spice storage cabinet. I had it emptied and was halfway through the process before I realized my mistake. It was a mixed up mess of small mason jars, tin spice containers, and plastic spice containers. There was no rhyme or reason to it at all. The cabinet I use for spices is on the end of a row of cabinets and is positioned at an angle. The inside of the cabinet is actually a triangle. It’s small and odd, but makes the perfect spice storage cabinet. 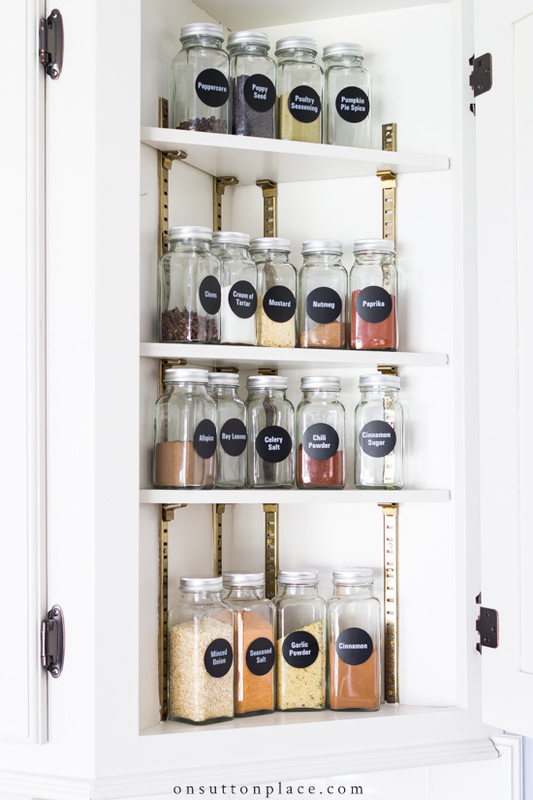 I chose these particular spice storage bottles because they fit my cabinet, plus they came with the pre-made labels. What a time saver that was. They also included a small plastic funnel that was perfect for filling the jars. I have never had a spice cabinet that looked like this…and I am in love with it! Embracing these cabinets and figuring out solutions to make them functional has been a challenge. It’s been good for me because I’ve had to look at this kitchen with fresh eyes. Instead of being annoyed and negative, I’ve had to be determined and positive. Are there still things that bug me? Of course…but as this project progresses, those things no longer out weigh what’s good. I love your decorating and organizational ideas! My kitchen has been a disaster with too much stuff and too little storage since my husband and I downsized from a large 2 story home to a single story 2 bedroom home 6 years ago. I have finally cleaned out my spice cabinet! Amazon will deliver several of your recommended storage products tomorrow (containers and glass spice jars), and I’ll finish getting things in proper order. I discarded many spices that I know I moved from my previous home. If I haven’t seen it, I haven’t missed it and it’s undoubtedly out dated. I plan to tackle the rest of my cabinets and the refrigerator by the end of this month. Thank you for always inspiring me to be more organized. Where did you buy the containers to hold your flour and sugar. I like the containers to hold a #5 bag of flour or sugar, confectionary sugar and brown sugar. Hi Maureen…the containers were all purchased on Amazon. The links are at the end of the post! Happy Valentine’s Day! Love your makeover! What is your label source? Do you have a special printer to get that white on black so perfect? Hi Seana…the labels came with the bottles. It was such a time saver and they look great! Link to the bottles is at the end of the post. Glad that you are enjoying a more organized baking area! It makes baking more enjoyable, doesn’t it?! My cabinets are organized using lazy susans and air tight containers too, and they are very functional, but not very pretty. Your cabinets are BEAUTIFUL! KonMarie would be proud! Great work!! Oh Ann, thank you so much for this post, which put a huge smile on my face today… your comment of “that bowl… I have no idea why it’s there…”… not coping well with health issues at the moment, wanting so desperately to be able to keep my home as I would love to… but cant right now. I have cupboards full of things I have no idea why they are there, who put them there, and reading your comment today, I felt grace come over me, and peace. You have no idea how much I needed to read this post today. So thank you for your honesty. Blessings to you and yours. I love your attitude of finding contentment in what you currently have. Choosing to make it work is hard sometimes! I LOVE the lazy susans! Brilliant! And you made them functional, tidy and beautiful! That’s my favorite thing about your blog! 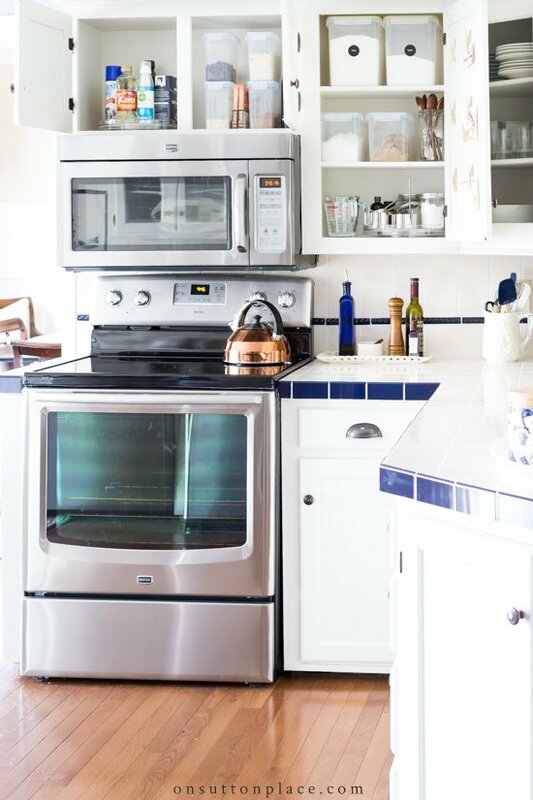 ps – how do you like your Maytag appliances? 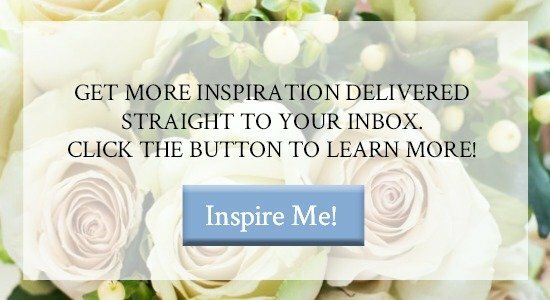 Ann – absolutely inspiring! I love your honesty and changing perspective in regards to your kitchen cupboards. I think the “key” to your kitchen organization is to take some time and research the correct storage items to match your cupboards. They are out there (somewhere), but one needs to spend time and some money finding what is right. 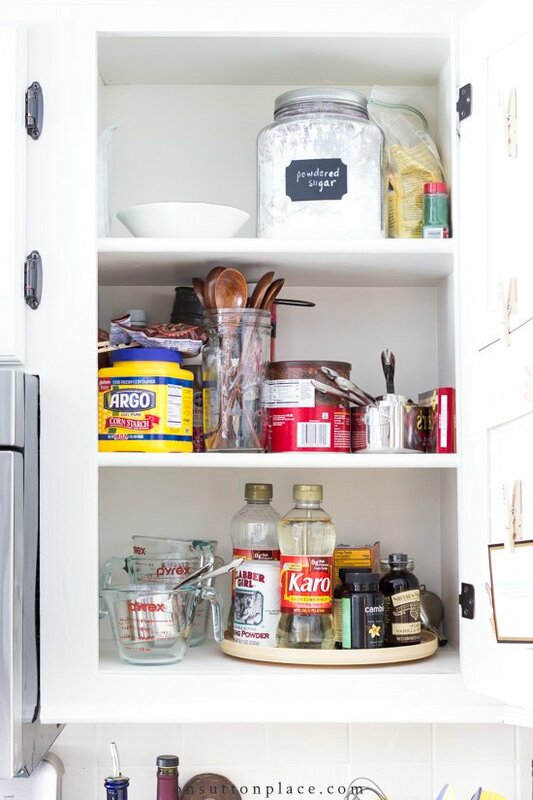 I’m looking forward to your next post as you tackle your kitchen cupboards! I just wanted to say; I love 💕 your tile counters tops.. They, really work for you.. It gives that vintage feeling. Also, everyone is in to ripping them out. But, in your case. They, give a nice cozy look … Also, nice & clean. Be mindful of the lid on the mason jars when storing salt. The gold typical lid csn corrode. Look for SS if possible. There are white plastic lids which you can get for wide mouth mason jars. I use a suction cup & fresh saver attachment to seal the metal lids on things that might be affected by air or humidity. I have mentioned before that I love your kitchen. It’s very homey and warm. Like another commenter said, I’m kind of tired of the ubiquitous (but still lovely!) grey and white kitchen. Your new organization looks so useful and is pretty to boot. Your post inspires me to reorganize, too. That will be the project this week! Now I’m ready to try again!! Your re-organized cabinets look great, Ann! I’m wondering what you do about expiration dates. Every time I think about transferring pantry items to nicer containers, I can’t come up with a good way to keep up with expiration dates. Also, I like using lazy susans in the refrigerator for large milk, oj, etc containers or for condiments. Thanks for your inspiration! I’m so glad you mentioned this because I forgot to put this in the post! I bought some removable white round labels. I wanted to make sure they would come off of a jar without sticking. I put the expiration date on the label, and then put the label on the bottom of each jar. It worked beautifully and if I need to change the date, it’s very easy. I hope this helps. I will add this to the post and also link to the labels. Thank you so much! Thank you for the inspiration. Your neat cabinets motivated me to clean out my kitchen cupboards. I bought those same spice jars. I needed 36 since I have a lot of spices. I have them alphabetized in a drawer next to the stove. Everything else is in a labeled square see-thru stackable container. Since I have lupus and some new physical challenges, organization makes my life easier and less frustrating. I must admit cabin fever and a blizzzard also had something to do with my efforts to clean and organize it all. Looking good Ann ! I love the spice jars. Ann, I love how you work with what you have! It’s so refreshing to see a blogger work in a real space that we can all relate to. I think your kitchen is lovely, by the way. I, too, love to use of lazy Susans. I’m only 5’3”, and they sure help to access those items in the back of the cabinets. You have inspired me to transfer my baking soda, baking powder, and salt into Mason jars. That looks so much nicer than the originally packaging! Thank you for sharing with us. I keep my spices in the door of my freezer/refrigerator. Does anyone else do this? I have them labeled on the top (and numbered) so they are alphabetized and can go back where they belong for easy access!!! I am so enjoying following along with your kitchen organization. 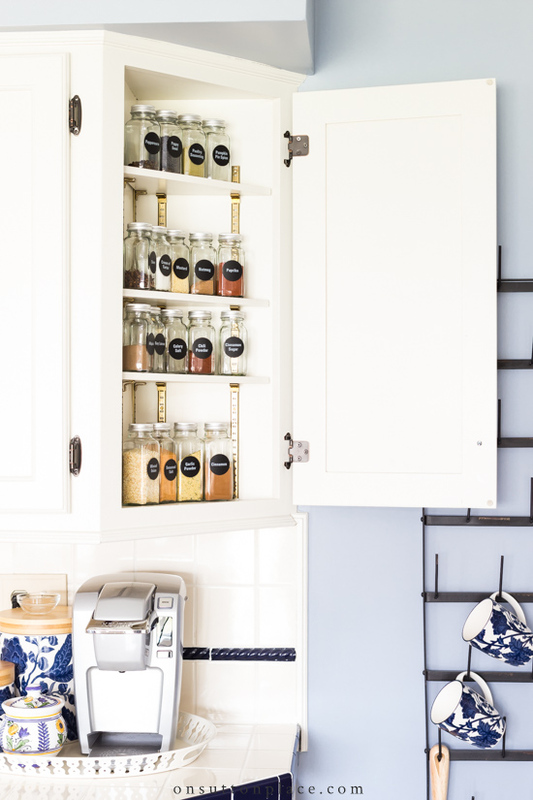 I love how you’re making your existing cupboards work for you! Looking forward to seeing what you come up with next. I also utilize my cabinet doors as storage. On the inside, affix as you like a thin sheet of metal (be sure magnets work 1st). You could use magnetic paint, but it doesn’t work well in my opinion for anything heavier than a few ounces. There are magnetic spice tins available *or* you can hot glue magnetic buttons to most anything. I use door backs for all my measuring items, small spice tins of specialty items like cardamom, indian and thai spices, my own spice blends, etc. I drink a lot of tea, so I have a tea cabinet with velcro tabs on reuseable ziploc bags for most all my loose leaf tea and custom blends. This method also works very well for plastic storage container lids! Thank you so very much for sharing…great ideas! Aren’t we all funny though…I prefer your kitchen to a “renovated” one. I am so tired of grayish and white. 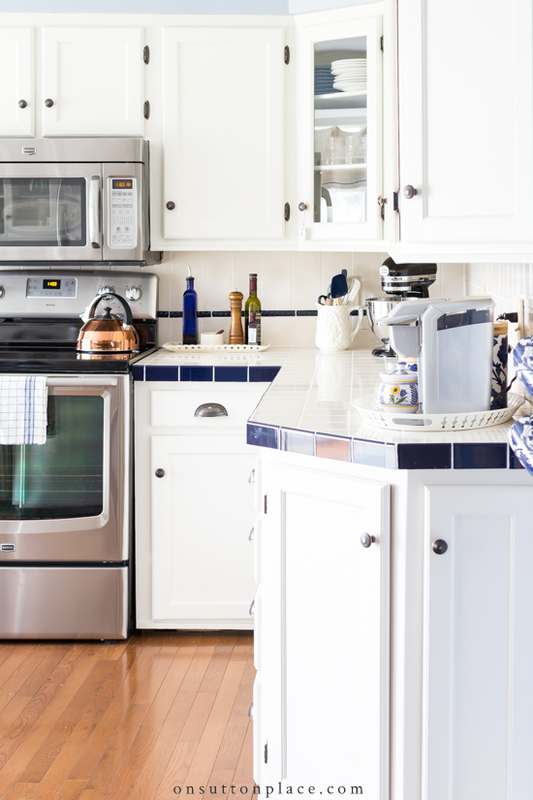 The blue tile edge is fresh and inviting. Of course your shelves look wonderful – great job! Do you have concern about warmth from the stove area affecting the chocolate chips etc? I store mine in the freezer. Brown sugar is kept in the refrigerator. Just a thought. Keep going – many of us anticipate that next “Ann – amazement”! No…I think the chocolate chips will be OK. The microwave separates the stove from the cabinet. Honestly too…I don’t use my stove top all that much! So glad you found something that would work! Quite the transformation! Well done on finding items that work for you! What a great job. I appreciate all your hard work and can’t wait to incorporate some of your ideas in my own disastrous kitchen! Congratulations on the amazing progress in the cabinets! I love some of the simple ideas you have highlighted such as putting chocolate chips into a storage bin instead of lots of slippery bags. The lazy susan with a high lip is genius. Thanks for opening your cabinets for us to peek inside, Ann! Love the spice jars – as always thanks so much for the great tips. The solution for the measuring cups I have that are similar to yours was to buy command hooks and tuck them under the upper cabinets. The white of the tape does not show on the white tile backsplash and they are not only handy they are decorative. Great new organization for your kitchen. I have a hard time downsizing my spice collection but have been working on it. Love using turntables in my pantry. I still keep my large glass canisters on my counter but I have lots of space and it works for me. Also makes me aware when I need to replenish supplies. I do quite a bit of baking and love to try your recipes. Did your cranberry orange breads for friends at Christmas and they loved it. Going to bake your vanilla cake for Valentine’s day in a heart shaped pan with pink frosting and fresh strawberries. Sounds so delish – can I be one of your friends? I’m really enjoying seeing your kitchen progress! Everything is looking so good!! Hope you have a great Sunday!